Does anyone know of or have an image of the maps from TOT? 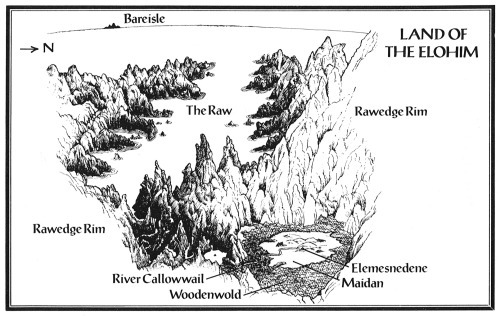 I found the one for Elemesnedene, but I can't find the maps of Brathairealm or the Sandhold (more of a diagram, side-on) that are in my edition. I have the Karen Wynn Fonstad atlas for The Land at the house. I can scan images from it if you like. There is a map of the Island of the One Tree but not a globe that gives the location of the island relative to The Land. That would be great! I've always wanted a peek at that book. THAT book is awesome! I keep it beside me every time I re-read the series. Old topic, but others may want to know the information, so I'll post on it. I like the painting that Blackhawk did of the island of the One Tree (not a map, precisely, but still a very good painting). And here's a recent upload of a scan on the land of the Elohim from The One Tree.